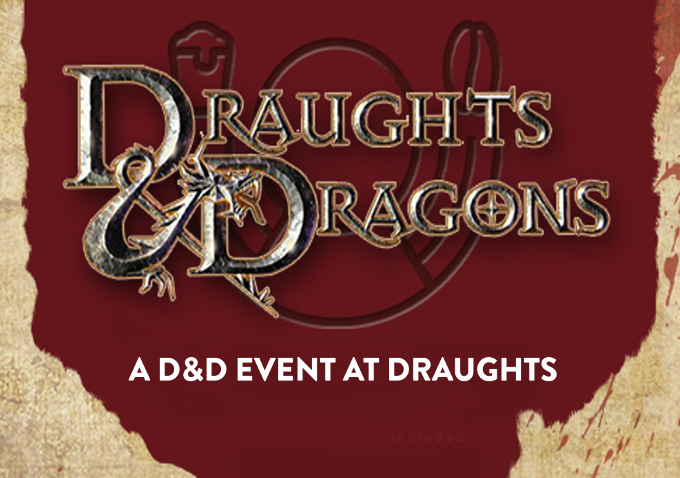 Double Draughts & Dragons – A Two Part D&D Adventure at Draughts Hackney! We’ve listened to your feedback over the past few months, and we know that there are some of you ready to take on an even bigger, greater and, dare I say it, a more dangerous adventure! So, for those brave enough to take it on, we introduce ‘Double Draughts & Dragons’ – a two night event for the more experienced players! Draughts & Dragons is an exciting RPG event at Draughts Hackney based in the world of Dungeons & Dragons, a land of goblins, magic, the undead and so much more. We welcome people of any skill level, and we’ll provide you with a selection of characters to choose from, and soon enough you’ll find yourself setting off on a fully planned quest which will be wrapped up by the end of the second night. Our guide and dungeon master, an expert in storytelling and dice rolling, will make sure you all have a memorable experience and will give you the perfect introduction to the world of D&D! IMPORTANT! This event takes place across two consecutive nights, with food and drink included on both nights. If you are unable to make BOTH sessions, please take a look at one of our other single night sessions instead. FEE: £40 including food and a beverage!